On behalf of the entire MC team, we want to thank the hundreds of passionate Montessorians who visited our booth at the American Montessori Society 2015 Annual Conference in Philadelphia, PA this past weekend. This was, by far, our best conference yet! We are already looking forward to Chicago 2016! 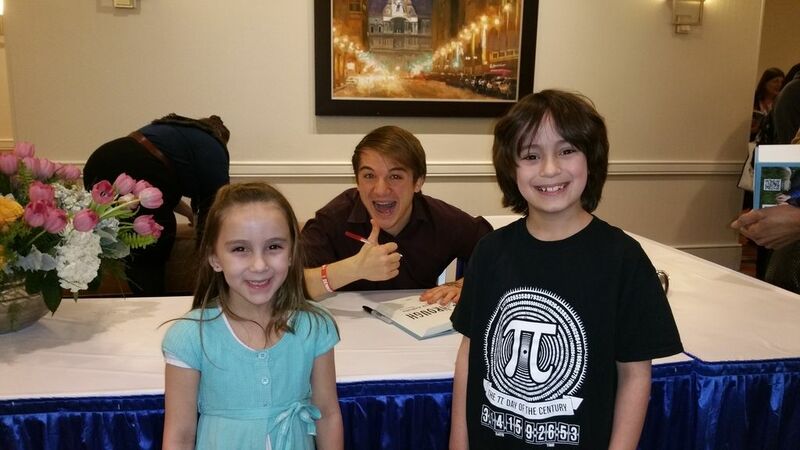 Sunday’s Key Note presentation by Jack Andraka was thoroughly engaging and inspiring. 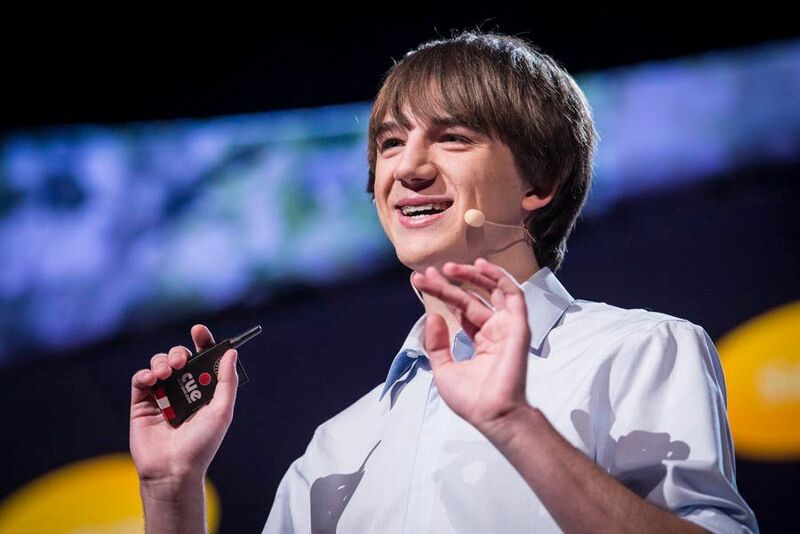 Jack Andraka is a teen inventor who developed a method for detecting pancreatic cancer in it’s earliest stages. This young man’s journey demonstrates a remarkably high degree of intrinsic motivation, creativity and tenacity. When asked to reflect on the experiences that impacted his determination and his clear love of science, he responded that the freedom to explore and make his own discoveries with hands-on materials really set the foundation for his love of learning. Jack’s parents supplemented his public school education (which he referred to as “stifling”) with a prepared environment at home where he had both the freedom to pursue his interests and access to supportive learning materials. Sound familiar? Jack credits the Montessori-like educational opportunities provided by his parents for cultivating his approach to learning. Indeed, his personal story is full of aspects that mirror the key tenets of Montessori: the opportunity to pursue one’s own interests, access to supportive materials/equipment, opportunity to concentrate for uninterrupted periods of time on work that interested him, a strong sense of his own potential for meaningful contribution, regardless of his youth. I felt fortunate to take my oldest two children, aged 9 and 7, to see Jack’s talk and meet him afterwards. They were excited, impressed, and inspired to meet Jack and hear his personal story. They were thrilled to buy a copy of his book “BreakThrough” and were able to get it signed! The book contains 10 STEM-related experiments that can be completed with minimal materials and are designed to inspire young scientists. Greetings! We are excited to announce a new update scheduled for release this week that will help take Montessori Compass into a new “plane of development”. Our team has been working very hard, improving the system based on feedback from Montessori schools around the world. Many updates have been released over the past few months, both big and small. Our latest update focuses squarely on the area of the application that matters most – the Classroom Dashboard. We’ve listened to your feedback and have made the things you do each day easier than ever. Our goal is to simplify your daily work flow, provide greater flexibility, and minimize the amount of time you spend clicking. While always a work in progress, we hope you enjoy this latest update. 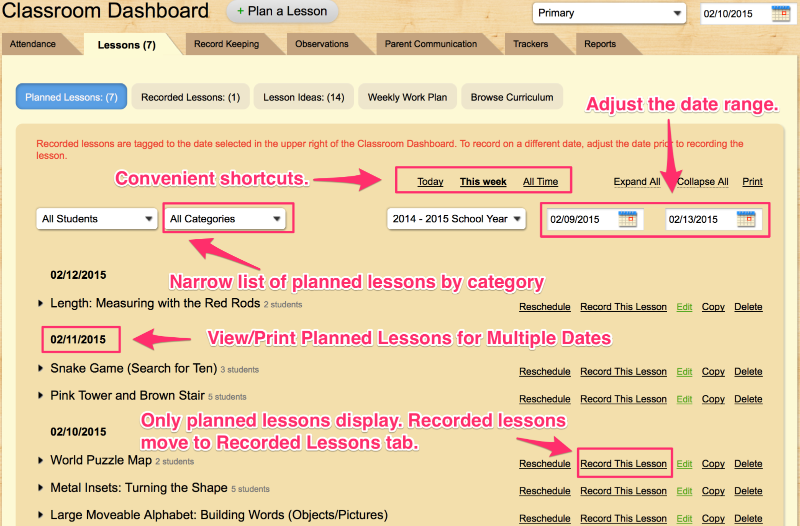 “Today’s Planned Lessons” and “All Planned Lessons” tabs have merged to provide a simplified lesson planning experience. 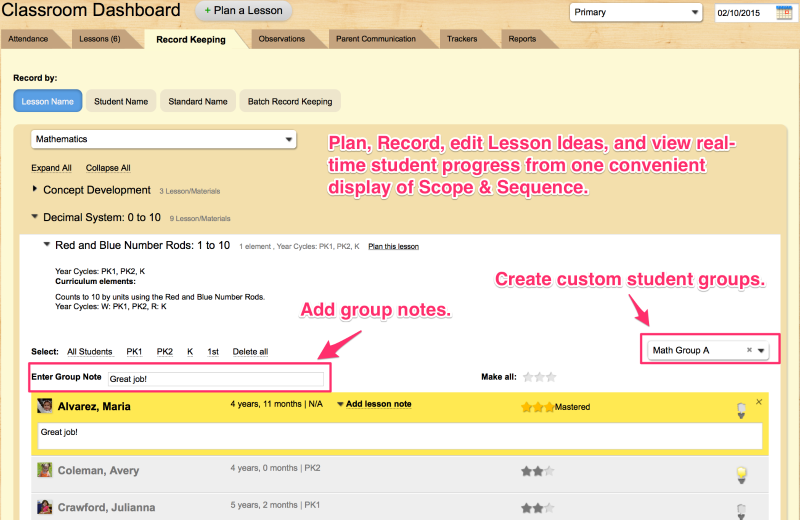 Adjust the dates or use convenient shortcuts to view/print planned lessons for multiple dates. Follow the child! 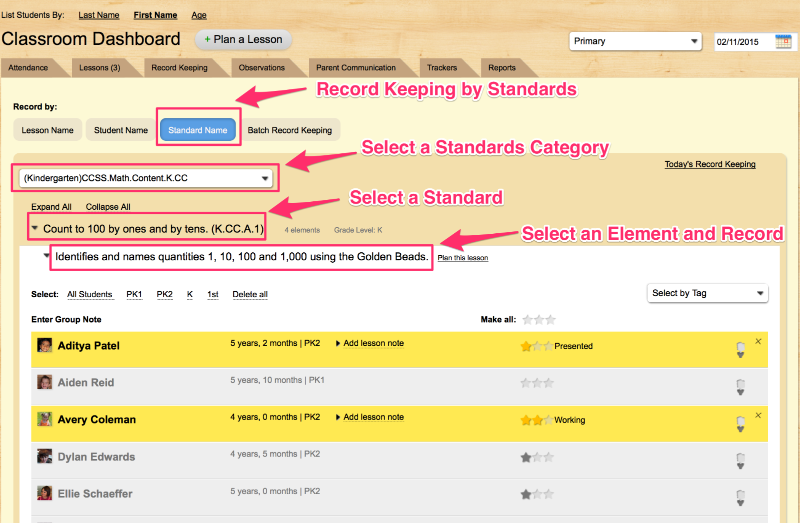 View all planned lessons (past, present, future) and record when child is ready. 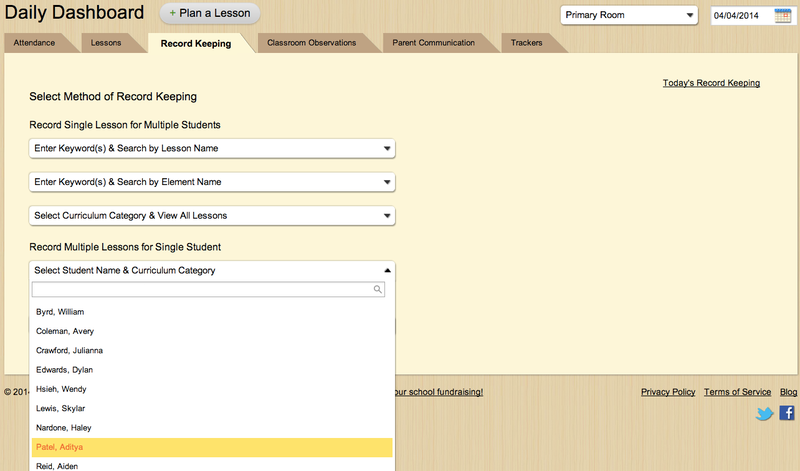 Only planned lessons display, as recorded lessons instantly move to Recorded Lessons tab. Plan a Lesson button opens in a new window, so it doesn’t interrupt your work flow. When saved, window closes and you are right back to where you started. A browser refresh may be required to view the new lesson. 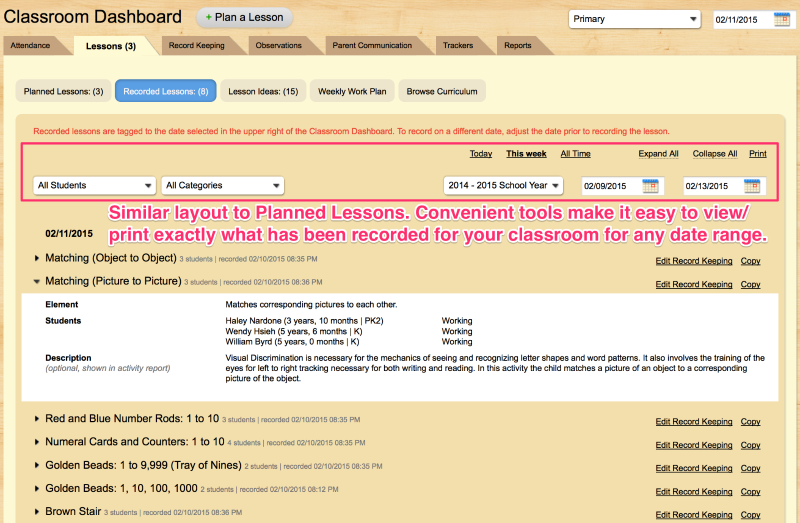 *Recorded Lessons tab has the same convenient layout! Record Keeping By Curriculum Category has been vastly improved! You can now Plan, Record, edit Lesson Ideas, and view real-time student progress from one convenient display of the Scope & Sequence. Students can be listed by First Name, Last Name, or Age. Student Name tab provides useful overview of planned lessons, recorded lessons, and lesson ideas for every child in your classroom. Links are clickable, directing you to updated list on the Lessons tab. Create custom student groups by utilizing “Record Keeping” tags (located in My Backpack/Tags). Instantly record a group note for each highlighted student. MC has always made it easy for teachers to stay in a Montessori environment, without the need to think about standards in the classroom. Simply record the Montessori lesson/material and the standard mapping takes place automatically behind the scenes. To provide greater flexibility, we now make it easy to do your record keeping in the reverse direction. 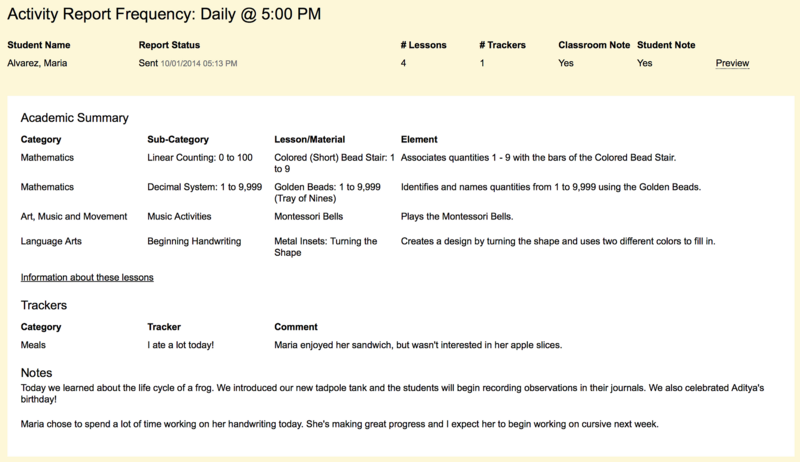 You can now choose a standard, view the mapped Elements tagged to the Montessori Lesson/Material – then record the student’s activity. A new Progress-At-A-Glance report has been added to the Academic Insights tab, giving you a birds-eye view on your classroom’s progress with the standards. We look forward to meeting with passionate educators, parents, and exhibitors from the international Montessori community. Come visit us in Philly, at Booth # 106. See you there! As a teacher in the classroom, the last thing you want to worry about is clunky software taking time away from your students. Our focus with Montessori Compass is to provide flexible tools, that adapt to YOUR work flow – not the other way around. We’ve taken another step towards that goal by making it easier to create custom lessons in real-time and record them instantly. No need to first add them to curriculum. Simply click the “Add Custom Lesson” link on the Record Keeping page, create the lesson, then record just like any other lesson. The lesson is recorded instantly and you are right back to work in your classroom. At a later time, you can relocate the lesson to a new location within your Scope & Sequence. By popular demand, we are pleased to announce the Student Tag feature just got even better! In addition to utilizing tags to group students together based on custom criteria for administration purposes, you can now create custom student groups for record keeping and lesson planning. When you create the tag, click the check box to designate it as a “record keeping tag”. That’s it! Now your custom student group will be available as a shortcut during both the lesson planning and record keeping work flow. Ever have one of those “oops” moments when you accidentally send an email, instant message, or text message to the wrong recipient?? This can be particularly problematic when managing all of the different types of messages you need to communicate to members of your school community. With Montessori Compass, messaging is now easier (and safer) than ever. If you send a message to the wrong recipient, simply click the message in your sent box. Then click the “retract” link. The message is permanently removed from the system, as if it never happened! In addition, you can view that status of messages along with a timestamp when it was read. Activity Reports help answer the age old question for parents… what did my child do at school today! With this lastest update, you can now customize the frequency of the reports by individual classroom. For example: Classroom A can opt for daily activity reports, Classroom B can opt for weekly activity reprots, and Classroom C can opt for no activity reports. We also added the ability to send automatically every 2 weeks and 4 weeks. Parent Communication is now more flexible than ever! Video: Much More Than a Fresh New Look! 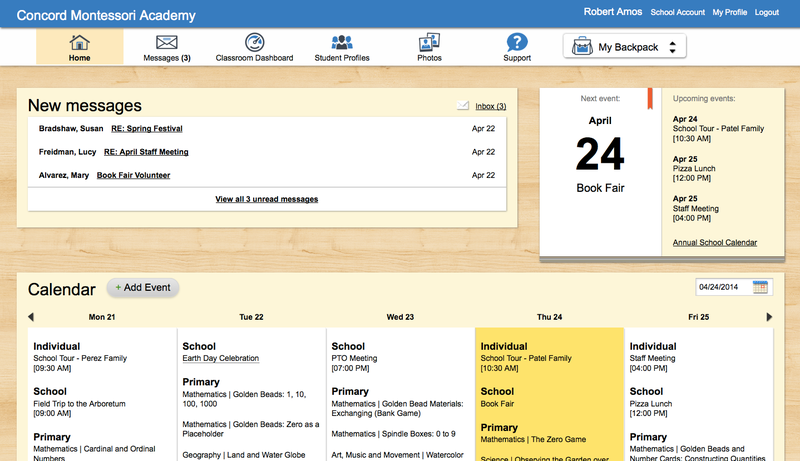 Introducing the New Classroom Dashboard! from Montessori Compass on Vimeo. 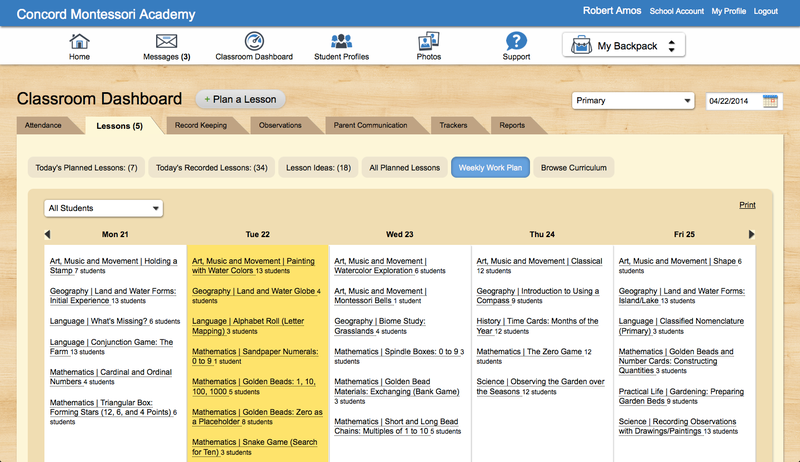 Introducing the New Classroom Dashboard! We’ve given the application a fresh new look/feel, with a more streamlined user interface and updated graphics. The new Classroom Dashboard is the central hub of the application. All of your day-to-day classroom management tasks can be easily completed in this convenient location. In addition to some of the recent improvements to the record keeping process, the Lessons tab has received significant updates. The new sub-navigation buttons on the Lessons tab provide a robust set of tools to simplify and enhance the lesson planning work flow. Lesson Ideas are a fabulous tool that enable teachers to quickly tag lessons they wish to present to a child in the future, without choosing a specific planned lesson date. 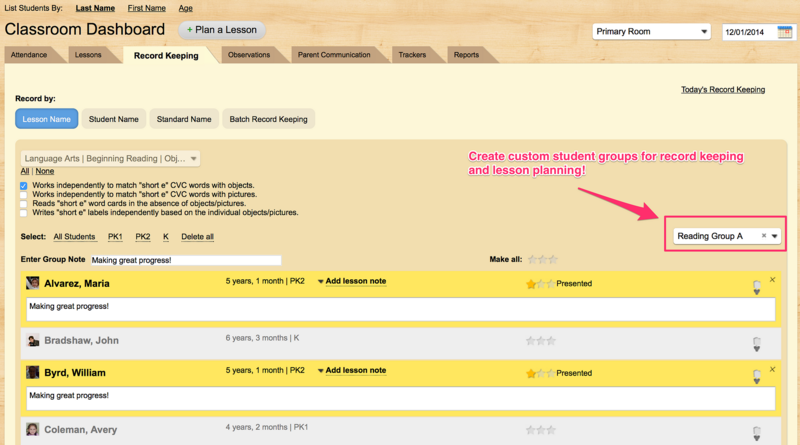 This handy feature has been optimized and brought to the forefront of the lesson planning work flow. It is now easier than ever to add new lesson ideas, view existing ideas for the classroom or individual student, and record ideas. Simply click the ‘light bulb’ icon from a variety of locations and the lesson will be instantly added to the child’s idea list. Everyone loves calendars. 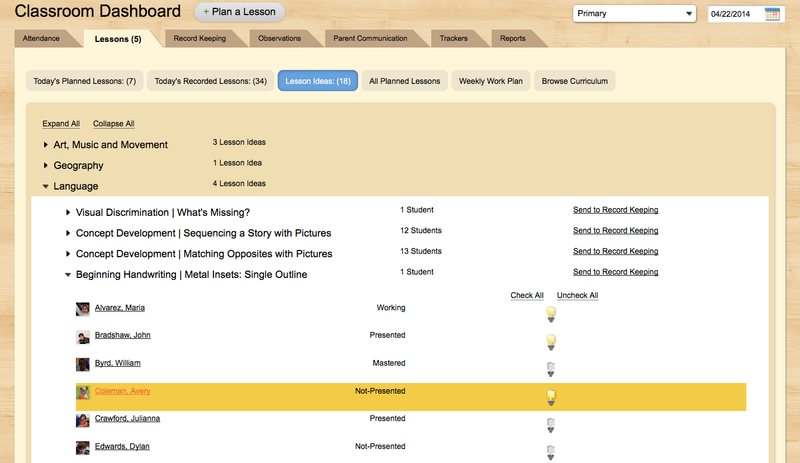 Instead of viewing planned lessons in a list format, you can now easily view and print a weekly work plan. 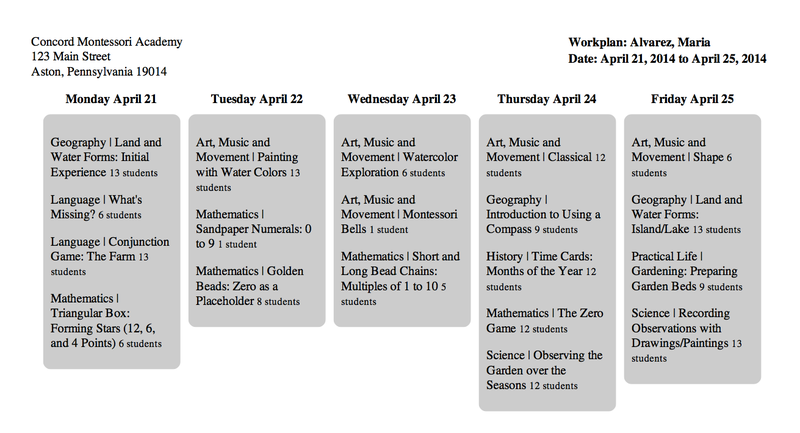 The work plan can be viewed for the entire classroom and can also be filtered by individual student. Click the print link and your work plan is converted to a print-friendly PDF. Valuable academic insights and classroom reports have been included in the updated dashboard. No longer do you need to click around to other sections of the application to obtain this valuable information. One of MC’s most popular reports is the Classroom Progress At-A-Glance. This useful tool enables teachers to choose an area of the classroom (e.g. 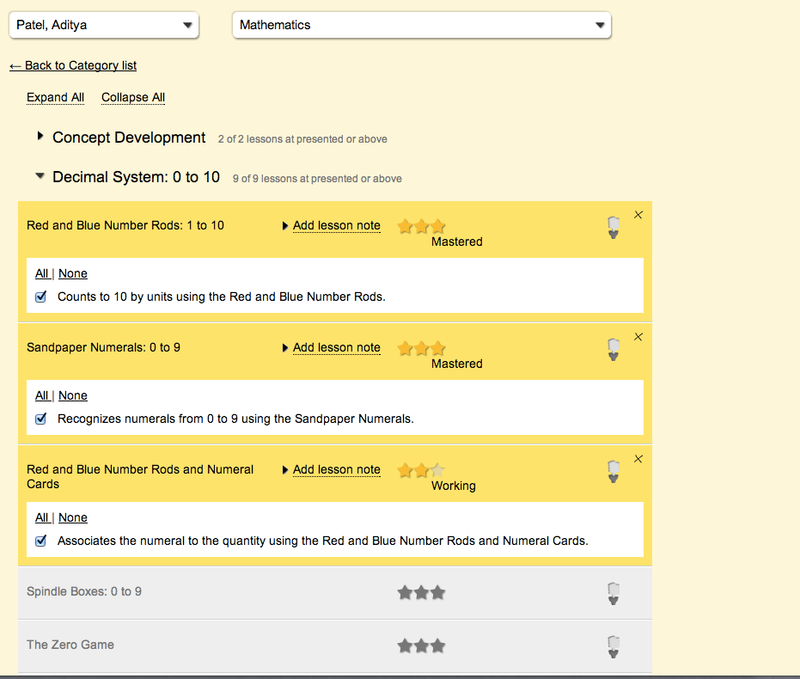 Mathematics) and view all student progress. This report can be narrowed down by category, sub-category, lesson, and element. Furthermore, a terrific new update enables users to download this report as a spreadsheet. This makes it easier to view the status of a large volume of lessons for your students at the same time. 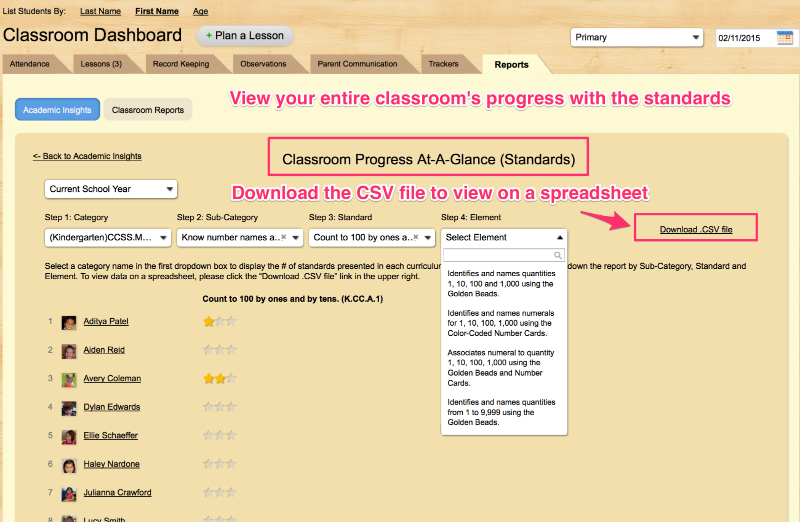 Simply click the ‘Download .CSV file’ link in the upper right to download a spreadsheet view of your classroom progress. You can select which sub-categories you wish to include on this report to make it easy to obtain the insight you are seeking. Open the .CSV file with your favorite spreadsheet app (e.g. Microsoft Excel, Google Docs, Numbers, etc.). Be sure to click the ‘text wrap’ feature in the spreadsheet app, which will make it easer to read long lesson names. Great news! We are very excited to announce the second major record keeping update of the week! Viewing lesson ideas & recording multiple lessons for an individual student is now easier than ever. Today’s update simplifies a teacher’s ability to view a child’s real-time progress in an area of the classroom & record/update activity with a single click. Montessori Compass users now have 5 convenient & easy-to-use ways to maintain accurate & up-to-date classroom record keeping. Step 1: Visit the Daily Dashboard/Record Keeping, choose the “Record Multiple Lessons for Single Student” option, and select a student name. 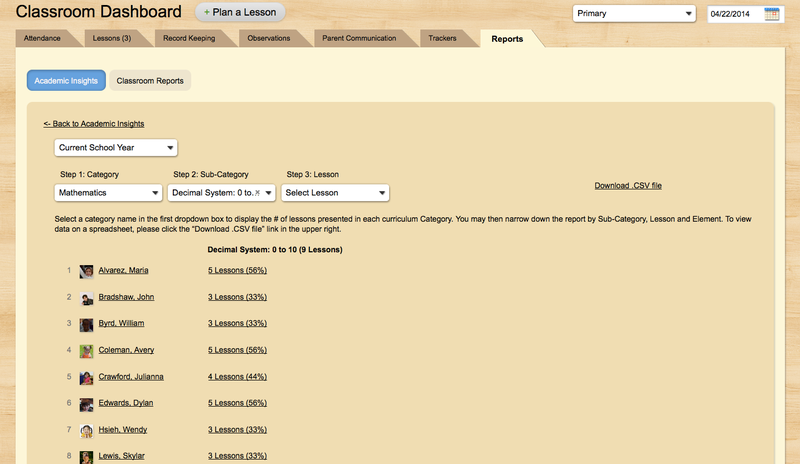 Step 2: Curriculum categories will be displayed, along with any available “Lesson Ideas”. If you are unfamiliar with the Lesson Idea feature, this is a fantastic tool that enables you to document lessons you wish to present to a child at some point in the future – without committing to a specific date. You can add lessons to this list by clicking the “light bulb” icon throughout the site. You can record Lesson Ideas from this page with a single click by clicking the desired assessment level star icon. You may adjust the assessment level, adjust the # of elements, and add a lesson note while in edit mode. You may also edit multiple Lesson Ideas at the same time. If you make a mistake, you can always click the X in the right-hand corner to delete the record keeping entry. Please note that anytime you record a Lesson Idea, it is removed from the list. To keep a lesson designated as a Lesson Idea, simply click the light bulb icon again. 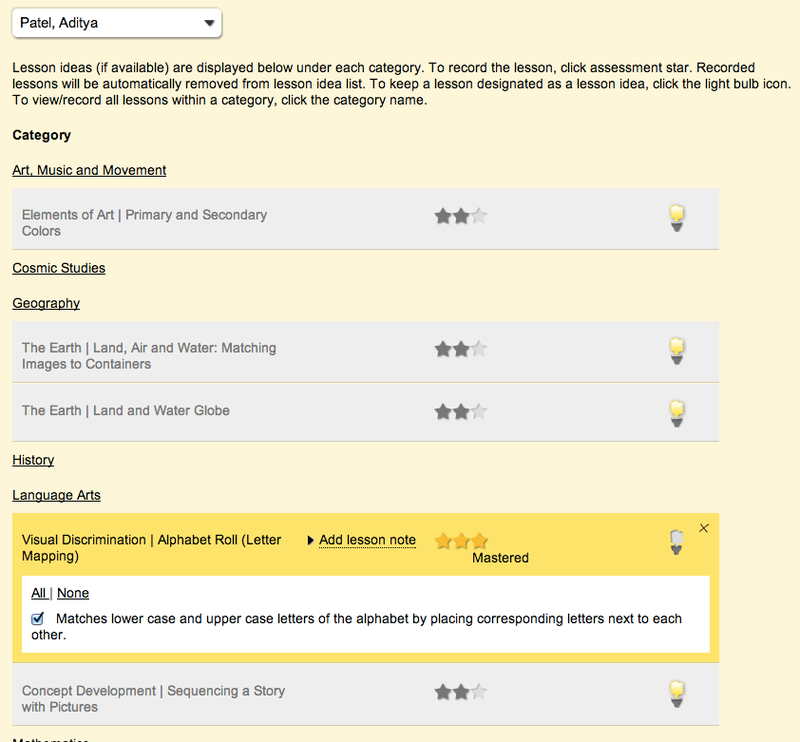 If you wish to view all lessons within an area of the classroom, click on the category name (e.g. Mathematics). Step 3: When you have selected a curriculum category, you will now be able to view the entire Scope & Sequence in that area of the classroom, organized by sub-category. There is a convenient “Expand All” link in the upper left corner to expand all sub-categories, which will display lessons nested below. You may also click the desired sub-category name to view a targeted list of lessons. As mentioned in Step 2, simply click the desired assessment level star to instantly record the lesson with a single-click. You may click multiple lessons consecutively and all will remain in the edit state. 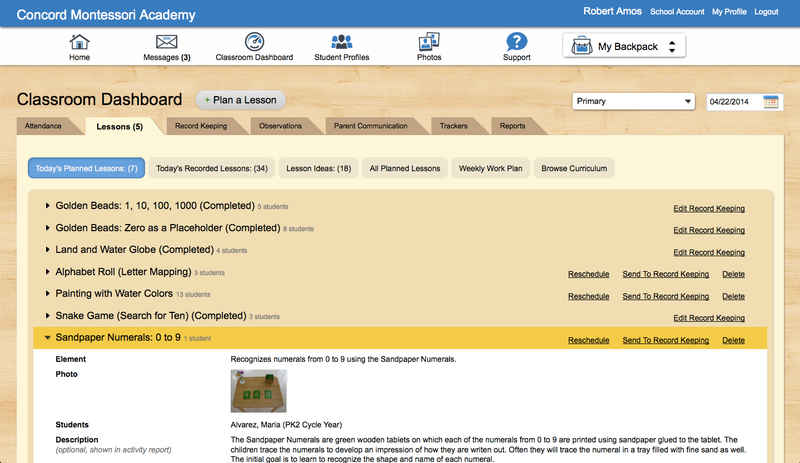 Lessons are saved automatically in real-time and tagged to the student’s profile. However, you may continue to make changes while lessons are in the edit state (highlighted in yellow). Batch Record Keeping is here! Recording many lessons for many students at the same time is now as easy as a few key strokes. We unveiled this feature just moments before the start of the American Montessori Society 2014 Annual Conference last week & received high fives (and some hugs) from many happy MC customers. This handy, time-saving tool is the direct result from customer feedback. Batch Record Keeping is the quick and easy way in which to document a high volume of lessons at the same time. This will be an invaluable tool for teachers who wish to document classroom activity via paper/pencil during the school day, then enter those records online at the end of the day/week/month. It also makes it incredibly simple to start using Montessori Compass at any point during the school year. Have you been considering migrating to MC from an alternate solution but don’t want to lose your data? With Batch Record Keeping, there’s no longer a reason to continue investing time and money into a service that is not meeting all of your needs. Back-dating your records is a breeze and MC’s 7-day customer support and live training will help guide you through the transition. 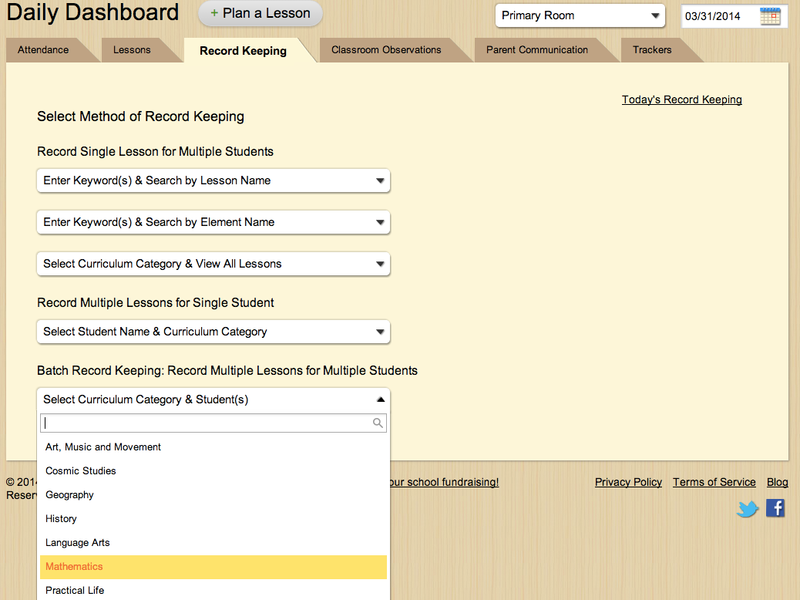 Step 1: Visit the Daily Dashboard/Record Keeping, choose the “Batch Record Keeping: Record Multiple Lessons for Multiple Students” option, and select a curriuclum category (e.g. Mathematics). Step 2: You can multi-select as many students as you would like, including selecting by cycle year. If you are back-dating a high volume of records, you may wish to consider starting with your third year students and working your way down to the first year students. There is a convenient “Expand All” link at the top of the Sub-Category list which will display ALL lessons in the Scope & Sequence from the selected Category. 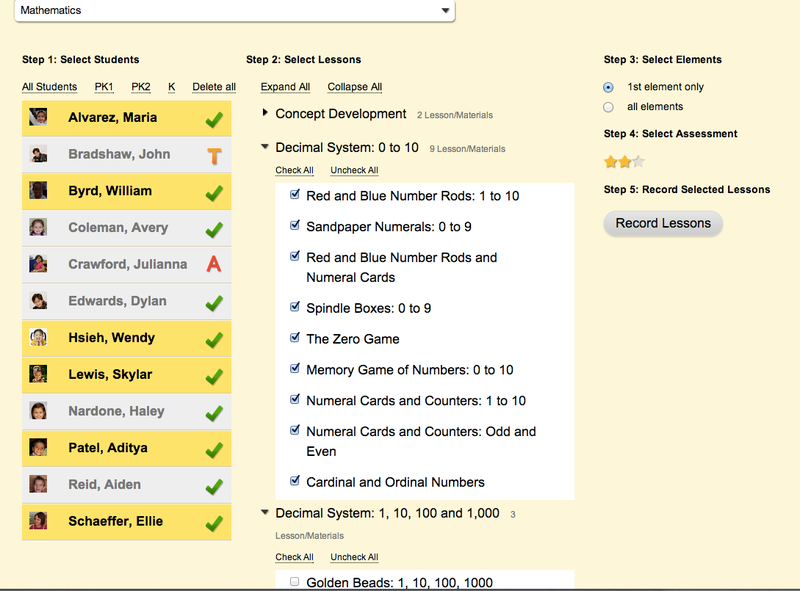 You may then multi-select lessons by clicking the check box next to the lesson name. Alternatively, you may click the “Check All” link at the top of the lesson list. This will automatically highlight all lessons within the sub-category. If you make a mistake, you can uncheck lessons individually or “Uncheck All”. There are 2 limitations when back-dating records in bulk. Since you are recording many lessons for many students at the same time, you need to choose either the “1st element only” or “all elements”. Elements are measurable learning objectives that are associated with the lesson/material. Some lessons have 1 element, others have several elements. The other limitation is the assessment level. The same level (as indicated by the assessment stars) must be applied to all lessons. Once recorded, lessons can be edited at any time. So you can always make changes to recorded lessons. 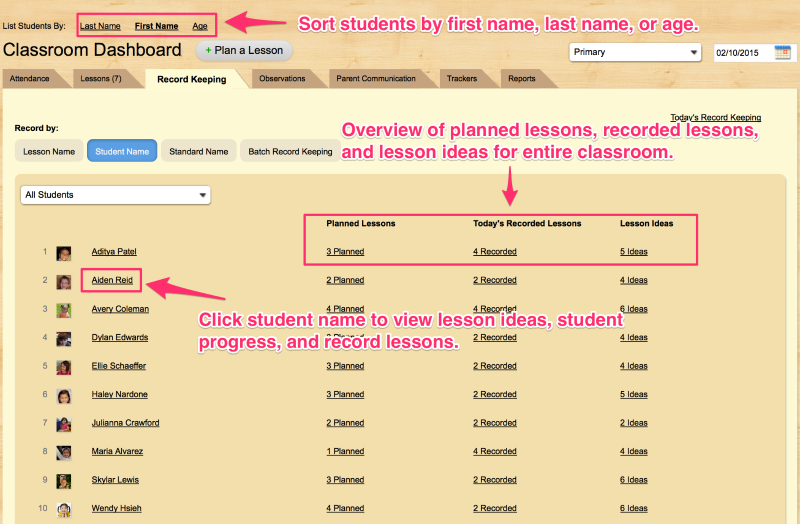 Click the “Record Lessons” button and all lessons will be recorded and tagged to the selected student profiles. Wow, that was easy! !